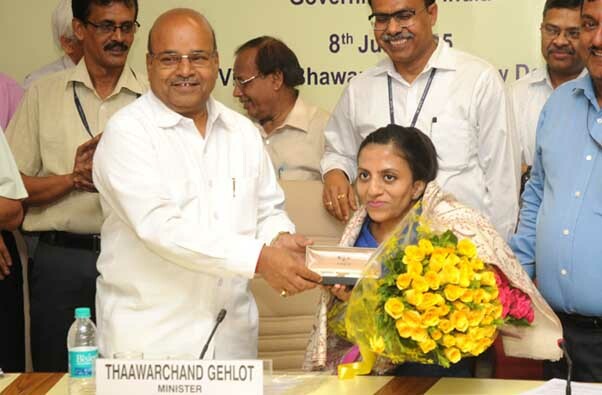 New Delhi : Union Minister for Social Justice & Empowerment Thaawar Chand Gehlot felicitated Ira Singhal, All India No.1 rank holder in the Civil Services Examination, 2014, in the presence of Lov Verma, Secretary, Department of Empowerment of Persons with Disabilities and other senior officers/officials of the Ministry here today. This is a historic occasion that All India No.1 rank holder of Civil Services Examination is a woman with disability. The Minister stated that she could be the Brand Ambassador for the Department for its schemes and programmes and her achievement shall inspire a whole generation of youth to come forward and achieve glorious heights. Secretary, Department of Empowerment of Persons with Disabilities Lov Verma assured her that the problems pointed out by her which are being faced by Persons with Disabilities (PwDs) while appearing in competitive examinations, shall be addressed and the Department will proactively ensure that seamless guidelines are available for PwDs. Joint Secretary, Department of Empowerment of Persons with Disabilities Awanish K. Awasthi informed that in consultation with UPSC, SSC, UGC and other educational bodies, the Department will strive to ensure that the guidelines are such that they help and promote the cause of PwDs to achieve their inclusion, participation and empowerment.